Genealogy Services, Old Photos, Postcards, Trade Cards, Etc. 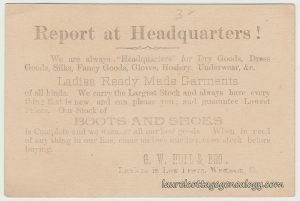 Trade card for G. W. Hull & Bro., Wauseon, Ohio. Circa 1870s – 1890s. I know this is not your standard Halloween offering, but it’s the closest we have at the moment, and quite unusual: A grasshopper riding a rat across the desert (though you’d think the grasshopper could get there quicker on his own!) 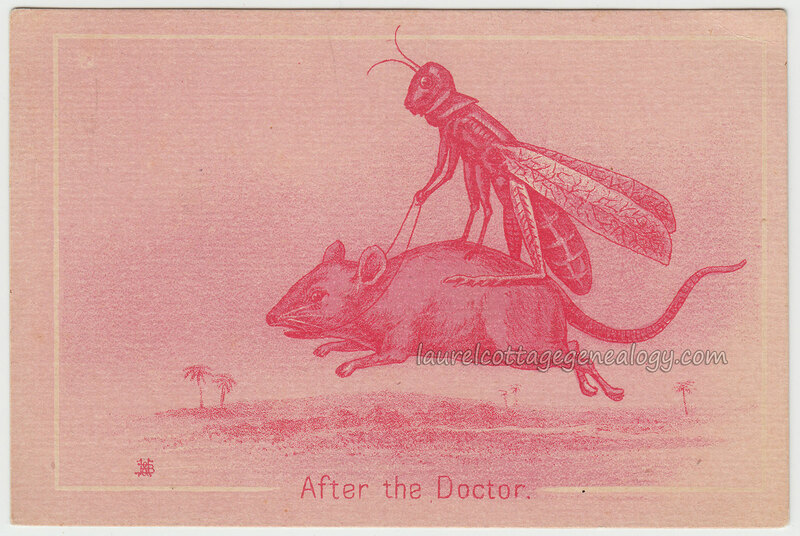 Time seems to be of the essence; note the alarmed look on the poor grasshopper’s face! The phrase “after the doctor” refers to someone going to get the doctor. G. W. Hull and brother are on the 1870 Federal Census for Wauseon, Ohio. G. W. is head of household, born in Pennsylvania about 1844, married to Rebecca, born Ohio about 1843. With them live John Hull, born Ohio about 1846, who we presume to be the brother, and Calvin Nikirk born Ohio about 1855. G. W.’s occupation is listed as dry goods merchant, with John and Calvin listed as dry goods clerks. Calvin is likely related to Rebecca, as we find that G.W. is George W. Hull who married Rebecca Neikirk October 9, 1866 in Henry County, Ohio. 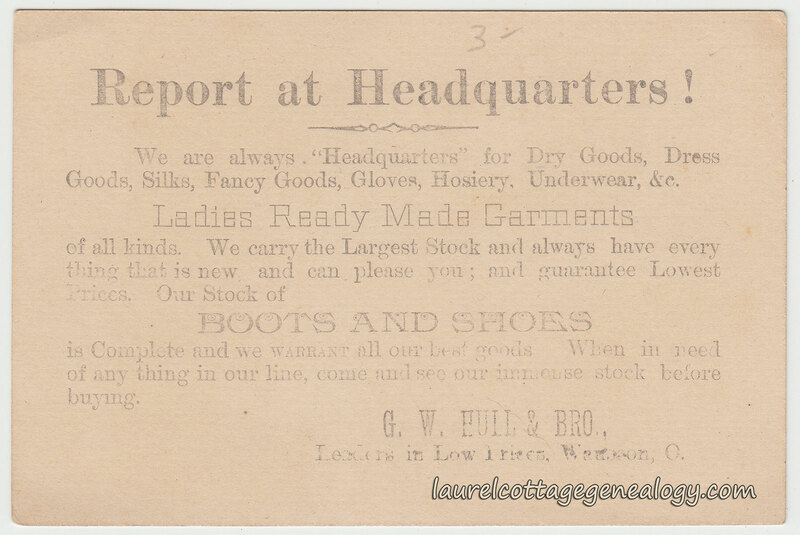 Below, from the front of the card, H & B, which we presume to be a logo, of sorts, for the dry goods store, rather than a lithography company name. Further searching reveals George and wife Abigail R. (Abigail Rebecca) in Wauseon in 1880, and their nine year old daughter, Verna. With them is George’s brother, Edwin. Thus, the “Bro.” was either John or Edwin Hull, or maybe conveniently worked out for both, if first John, then Edwin…..But wait, living next door, in 1880, is Henry Hull, dry goods merchant, so Henry is a third possibility as the brother in the dry goods business. Abigail died in 1891 and by the 1900 census, G. W. had remarried. His second wife was Lottie (maiden name French per Ancestry family trees.) George, per Find A Grave, was born July 23, 1843, died December 23, 1915, and was buried in the Wauseon Cemetery. Sources: Wauseon, Ohio. n.d. https://en.wikipedia.org/wiki/Wauseon,_Ohio (accessed October 30, 2017). Dry goods. n.d. https://en.wikipedia.org/wiki/Dry_goods (accessed October 31, 2017). Year: 1870; Census Place: Wauseon, Fulton, Ohio; Roll: M593_1202; Page: 57B; Family History Library Film: 552701. (Ancestry.com). Jordan Dodd, Liahona Research. Ohio, Marriages, 1803-1900. (Ancestry.com). Year: 1880; Census Place: Wauseon, Fulton, Ohio; Roll: 1017; Family History Film: 1255017; Page: 173D; Enumeration District: 024. (Ancestry.com). Year: 1900; Census Place: Delta, Fulton, Ohio; Roll: 1270; Page: 10A; Enumeration District: 0015; FHL microfilm: 1241270. (Ancestry.com). Abigail R. Hull. Find A Grave Memorial# 9598090. Findagrave.com. George W. Hull. Find A Grave Memorial# 9598085. Findagrave.com.